TM 9-243 HOW TO USE A BOX WRENCH 1 Select the size of wrench that fits the nut or bolt. 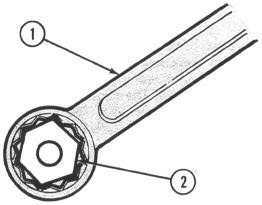 2 Place the wrench (1) on the nut or bolt (2). 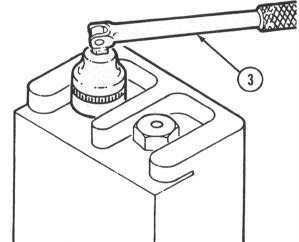 Swing the wrench clockwise to tighten and counterclockwise to loosen for a right hand threaded nut or bolt. Reverse the above for a left hand threaded nut or bolt. 3 If there is insufficient room to swing the wrench in a full circle, lift it completely off the nut when it comes to the limit of the swing, and place it in a new position, permitting another swing. A swing through of a 15 degree arc is usually sufficient to continu- ously loosen or tighten a nut or bolt. 4 After the nut is tight, give it a final tightening. 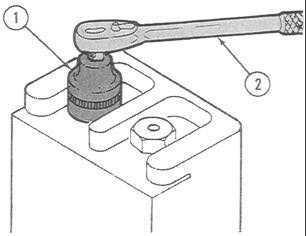 USING A SOCKET WRENCH 1 Select the size of socket (1) that fits the nut or bolt to be turned and push it onto the handle (2) which is best suited to the job. 2 If there is room to swing, use the ratchet handle. (The handle may be made to ratchet in one direction for tightening work and in the other direction for loosening work.) 3 Swing the handle back and forth to turn the nut in the 25-14 desired direction. (The socket need not be raised from the nut at the end of each swing.) 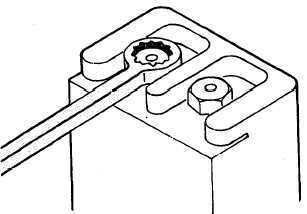 4 When a tight nut is to be loosened or a nut is to be set up, the nut hinged handle (3) can be swung at right angles to the socket to provide the most lever- age. At the point where the nut turns easily, the handle can be swung to a vertical position and twisted rapidly between the fingers in the same manner as a screwdriver.